Nuta Kotlyarenko immigrated to America from Kiev at age 11, and bought into the American Dream big time. After kicking around the country as a shoeshine boy and a boxer (and indeed, he claimed, as a companion of Pretty Boy Floyd), Kotlyarenko– by then, “Cohn”– and his wife opened a New York lingerie store, Nudies for the Ladies, specializing in custom-made undergarments for showgirls. In 1947, after relocating to Los Angeles– and taking “Nudie” as his given name– Cohn persuaded a young, struggling country singer named Tex Williams to buy him a sewing machine with the proceeds of an auctioned horse; in exchange, Cohn made clothing for Williams. The creations were so popular that Nudie opened a North Hollywood store to feature his chain-stitched and rhinestone-studded creations. 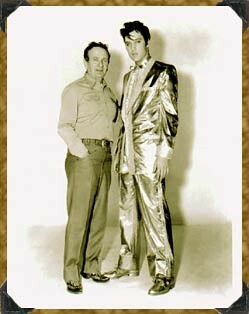 Over the years, Nudie gave dozens of performers their signature looks, from Elvis’ $10,000 gold lame suit to the costumes of Roy Rogers and Dale Evans. But his specialty was country (and country rock) singers: e.g., Porter Wagoner (a peach-colored suit featuring rhinestones, a covered wagon on the back, and wagon wheels on the legs), Hank Williams (a white cowboy suit with musical notations on the sleeves), and Gram Parsons (the suit he wears on the cover of the Flying Burrito Brothers album The Gilded Palace of Sin, featuring pills, poppies, marijuana leaves, naked women, and a huge cross). John Lennon was a customer, as were John Wayne, Gene Autry, George Jones, Cher, Ronald Reagan, Elton John, Robert Mitchum, Pat Buttram, Tony Curtis, Michael Landon, Glenn Campbell, Hank Snow, and numerous musical groups including “that little band from Texas,” ZZ Top. Nudie died in 1984; the store (which remained open under the management of his daughter) closed in 1994. 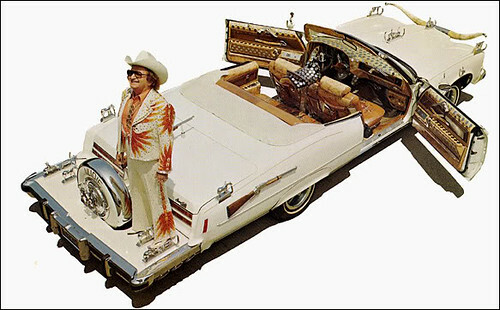 But his work remained prized– Porter Waggoner reckoned, just before he died in 2007, that he had 52 Nudie Suits, costing between $11,000 and $18,000 each (and worth by then much, much more). And Nudie’s legacy remains strong. His glittering garments were a bright stab at the conformity of their times… and set the precedent (if they didn’t in fact lay the foundation) for the Culture of Bling that has erupted out of Rap and Hip Hop into life-at-large. For more wonderful photos of Nudie, his creations, and his cars visit Nudie (“the official site”) and check out the wonderful pictorial essay at The Selvedge Yard.